Island Barn Reservoir Sailing Club has decided, after much debate, to make the RS200 its standard 2 handed dinghy. It has bought 3 new RS200 for use by its members. This event showed why these were such good decisions. The eagerly awaited first meeting of the regional SEAS RS200 series, organised by new Class Captain Carl Mayhew, attracted 27 entries. All competitive sailors would gladly trade sunshine for a good breeze and this they did. A steady force 4 from just west of south, accompanied by grey cloud and drizzle, made life easy, if not pleasant, for Race Officer John Smith and his team. The course was windward-leeward with a separator mark just after the windward mark and a gate at the leeward end. 4 races were held, with 1 discard. At the briefing the Race Officer had politely threatened black flags if general recalls became necessary and Race 1 got away cleanly. Rob Janering and Ian Gill from Wembley led at the windward mark, but Dave and Nicky Derby from Bough Beech got their downwind lanes right and took the lead, which they held to the finish. After three average laps, James Boyce and Sam Tozer from Papercourt had a blinder of a final run, picking up 3 places to finish second, with Janering a close third. The Race 2 start was a little too competitive, particularly at the committee boat end, where three boats were called back. The Derbys chose a safe mid-line start while Boyce/Tozer took advantage of a late wind shift left and executed a perfect pin-ender, tacked, crossed the fleet and built up an increasingly large lead to finish the race a half leg clear. In the chasing pack the Derbys led at the windward mark from Juliet Charles and Lina Haines from Burghfield. Steve and Judy Restall from Downs rounded in fourth and last years SEAS winners Andrew and Jeraldine Peters were in fifth. The Derbys had a minor disaster at the leeward gate when their spinnaker halyard jammed halfway down, allowing three boats through. The Restalls and Peters passed Charles/Haines to take second and third at the finish and the Derbys regained several places to take fifth. At lunch it was clear the winners were likely to come from Boyce/Tozer (3), Derbys (6), Restalls (7), R Janering/Gill (7) and Peters (10). Boyce/Tozer and Janering/Gill both arrived late at the start for Race 3 (investigating the shift cycle on the beat can have its disadvantages! ), leaving the Derbys, the Restalls and the Peters to fight out a battle of the married couples. Initially, the Restalls led from the Peters and the Derbys. But the Derbys' relaxed style hauled them both back to give them a win, with the Restalls second and the Peters third. Ex Topper sailors Tom Morris and Emma Porteous took fourth. With one race to go and the discard kicked in, the Derbys led on 2, with Boyce/Tozer on 3, the Restalls on 4 and the Peters on 6. So, all to play for. Boyce/Tozer were not only present at the start of Race 4 but led off the line. After the first tack, Boyce/Tozer led the Derbys by three boat lengths and these two drag-raced out to the right. The Derbys decided not to tack, so Boyce/Tozer had to hold on almost to the lay line to cover. They finally deserted their cover and tacked. The Derbys went even further to the right to gain clear air. Fortunately for both boats the wind stayed on the right. This killed off any chance of a late charge from the Restalls and the Peters who had gone left. Each, disappointingly, had their worst race of the day. At the end of lap 1 Charles/Haines led from Morris/Porteous. Boyce/Tozer was third, the Derbys fourth, with four laps to go and all still up for grabs. On the second beat, Boyce/Tozer managed not only to cover the Derbys but also to pass the leading two boats - no mean feat. They extended the lead to the finish, the race finishing Boyce/Tozer, Derbys, Morris/Porteous, Charles/Haines. By the narrowest of margins Boyce/Tozer (4 points) took the event from the Derbys (4points) on a last race tiebreak, with the Restalls finishing third (9 points). That the leading seven boats each came from a different club illustrates the wide popularity of this great boat. Island Barn thoroughly enjoyed hosting this first RS 200 SEAS event of the season and looks forward to being given the opportunity of hosting many more. Thank you RS 200 Class Association. Please come again. 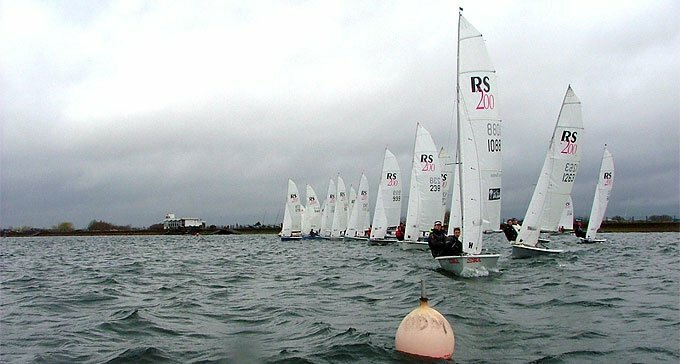 The SEAS in 2010 consists of eight meetings at a variety of venues through South Eastern England taking in reservioir, gravel pit, estuary and open sea sailing. All are welcome, meetings usual attract 20-30 boats with crews of a wide range of ability and racing experience and a SEAS meeting is an ideal way to sample racing your RS200 in a reasonably sized fleet. You do not need to be a member of the RS Association to enter individual SEAS meetings and last year over 100 crews took part, making SEAS the largest regional series for two person dinghys. The format is usually two races before and two races after lunch. The series prize giving will take place after the final race at Wembley where a host of goodies will be given out to the sucessful crews. For futher details please refer to the events section of the RS200 website.